I have a friend who likes spiders. She admires their usefulness, happy that they eat so many bugs and garden pests. She is supremely tolerant of her eight legged friends, even living in peaceful harmony with a black widow spider who lives behind her house. As my friend told this story, I shuddered in disgust and horror. I am the proud owner of a serious case of arachnophobia, and I could barely imagine lying down to sleep at night, knowing that just outside my window there lurked a venomous and deadly guest, busily working to ensnare her prey. I said as much to my friend, but she shook her head at my foolishness. “But they eat bad bugs.”she said, trying to talk me out of my fear. 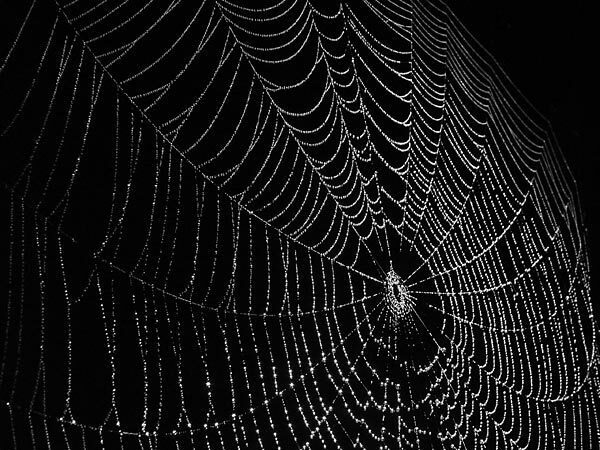 “And they build such amazing webs.” She went on to describe the densely woven tapestries, stretching from wall to wall behind her house, providing a place for the little spider to hide, as well as a source for her sustenance. She didn’t convince me of the benefits of spiders, of course; I could no more live in the company of a black widow than I could bring an alligator into the living room as my pet. But she did get me thinking. She got me thinking about the threads that form our own life webs. The black widow conversation took place at a gathering of old friends, people I’ve known for more than 4o years. As one of our group put it, “These are people who knew me before I had any idea who me would turn out to be.” Some of us met when we were twelve years old; some even younger. I’ve known one of them since we were in the second grade! And here we were, gathering to eat and laugh and catch up with each other at the age of 57! There are threads that bind me to these people, as surely as the spider’s web connects one wall of my friend’s house to the wall on the other side. Those ties, those filaments of friendship, bind my life to the lives of my old classmates, and they branch out to the spouses, partners, children and parents of those friends, too. I pictured those little strands of silk being reinforced and strengthened with each visit and each shared memory, like the web of the spider being strengthened as she passes back and forth across it. Each of us has a web like this, made up of the connections to all of the people in our lives. I know that the strongest, most durable threads in my life are made of the links to my husband and children, and to my parents and siblings. But each of those links branches off, too, to their friends, loves, partners, parents. There are threads that bind me to the people at work, and to the people in their lives. And there are more and more threads, going out and out, building the web that is my life. Threads that spread out to my students and their families, and to the people in my town, and to my doctor and my hairdresser and to the mechanic I’ve known for 23 years now! And just like the beautiful, intricate web that shelters and nourishes the black widow, the web of my own life provides me with support, shelter and nourishment for my heart and my soul. And I know that each time I connect with another human being, I am adding a thread to the web of that person’s life, and that each web is joined to millions of others. I’m still afraid of spiders, but I have become a huge fan of those artful, delicate, ever changing webs, and of all that they provide. A toast to everyone in my web: thank-you!!! I spent the morning working on a post about a Tennessee couple that shot their baby during an argument, so I wasn’t in the best of moods when I ambled over here to read about spiders. Since I share your disgust over the obviously alien creatures, I was delighted to discover that I’m leaving your site (as always) in a much better humor than I arrived. Thank you so much for such a lovely compliment! I live a very charmed life, and I’m working hard at finding ways to remember that fact. Sometimes it takes a black widow spider to shake me out of my crankiness! Jane Mcgonigal contends that one of our emerging ‘superpowers’ is the ability to collaborate. Looks like you beat her to it! Oh, I don’t know. I’m feeling “supported by a web” but I don’t know how collaborative I am. Kind of makes me think of the ecology webs that we teach about in the fifth grade. We are all linked, whether we recognize it or not, and those links are what sustain us. It’s just that our young folk are so good at taking the emerging technologies and just nonchalantly turning them to their own novel uses. While they lack skill and concentration they can more than make up for that with their inventiveness. What’s more they spend so much time doing it that they’ll be masters at it long before we can make them ready to handle it.